What would happen to your business if your entire site were suddenly lost? I don’t mean temporarily unavailable, I mean gone. Scary, right? It happens more than you can imagine. Sites get hacked, host servers crash, updates disrupt functionality, and site owners poke around where they shouldn’t and break things. Get this free report on How to Backup Your WordPress Site and make sure you are protected from site loss. Maintaining your WordPress site is a critically important aspect of site ownership. One of the most vital tasks of maintenance is to back up your site on a regular basis. As a site owner, you have no excuse to overlook this important step. There are multiple plugins and services available that completely automate this process. But, all of those plugins and services are not created equally, and some aren’t worth the time it takes to install them. The three places your site data is stored. What must be backed up regularly. Where your backup files should be kept. 14 plugins, services, and storage options. Full descriptions, prices, plus pros and cons of each. Advice on backup strategies for your site. Can you afford not to know the information in this free report? There’s no registration needed and no obligation to do anything to receive it. 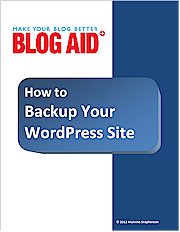 Get How to Backup Your WordPress Site – Free Report now!